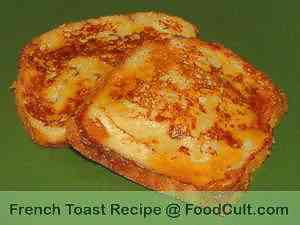 Galganov's Easy Recipe for Great French Toast! Add the milk and salt and beat until blended. Heat your pan with butter (or your choice of fat). Fry at medium-low heat until golden. Watch your pan carefully as French toast tends to stick while frying. Add a bit of butter and fry the other side until golden. Keep the prepared pieces hot in a warmed oven until all are ready to serve at once. You can always go get some Wallpaper Originals' Free FOOD Desktop Wallpapers for Mac & PC - now that you've found the web's best and easiest French Toast Recipe. French toast is one of those breakfast favourites ... and, typically, around here it's made with basic white bread. We like to think we don't eat a lot of Plain White Bread but when you think about it, it makes for a fine, traditional Grilled Cheese Sandwich ... and if you've had it just a little too long, it's a great bread for French toast! The plain white absorbs any flavours you put into your egg mix. It's a delight when soaked in that eggy-milky soup ... then fried to perfection. We, as you will have recognized, typically use our Basic White Bread for French toast but - it takes the mixture more nicely as a day-old (just a little staled) so what we like to do is cut our slices the night before and put them in a paper bag for use the next morning. They will have dried and will readily absorb as much mixture as you allow them SO ... we will bake our basic white a day or two in advance, use as much as pleases us, then cut the rest - leaving the end (heel), if nobody wants it to chew on) to stale for bread crumbs. All the flavours in French toast are actually quite gentle. Because, as Canadians we tend to use real maple syrup for our French toast, pancakes and waffles we don't want the syrup (also a relatively delicate flavour) to have to compete for attention). We make our French toast without added flavours such as vanilla, cinnamon and other delights as we might otherwise use. With this said, if you are using a bolder flavoured syrup, or sugar or some other topping, tossing 1/2 teaspoon of cinnamon and, perhaps, 1/4 teaspoon of vanilla into the mixture may be a good idea - but we won't when using that wonderful maple syrup. This recipe is written for four (4) slices of bread. It's exceptionally easy to reduce to two (2) or to expand by multiples of two.